Morning demo at the Sierra Nevada Field Campus, 2010. Photo by Ann Malmlund. and duration of both workshops can be found on their respective websites listed below. I really enjoyed doing this last summer, and look forward to seeing some familiar folks up in the mountains, as well as meeting some new ones. 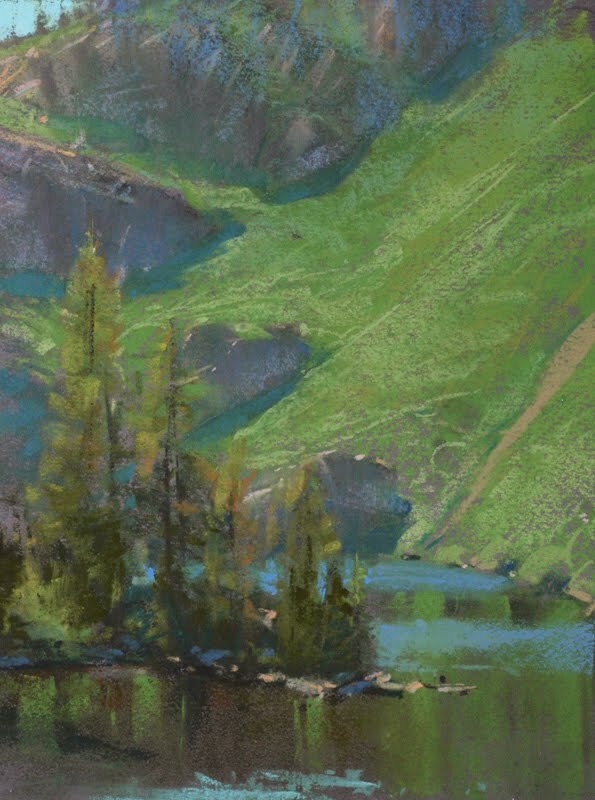 I've been teaching a class about light and color at Pixar for about ten years, and that is the genesis of the workshop, combined with what I've learned from painting outdoors for over 14 years. The region around the Sierra Nevada Field Campus is like a mini-Sierra buffet of beautiful scenery. There are numerous small lakes in glacially carved granite basins that are very accessible by car, or an easy hike. Accommodations are available at the campus. The campus itself is composed of large tents on platforms spread along a sloping river drainage, with a large dining hall/classroom building. Hot showers and bathrooms are provided. It is rustic but quite comfortable. The class sizes are limited to 12, to allow for plenty of one-on-one instruction. Regarding the Idyllwild campus, I've yet to visit it, but I was invited to teach there several months ago and researched it a fair amount before committing. The arts program has been running for 60 years, Ansel Adams has taught there, and some very talented contemporary artists, such as Ray Roberts and Peggy Kroll, among many others, will be teaching summer classes. The campus is located in a town at 5,200' elevation in the San Jacinto Mountains near Palm Springs. I'm going to head down there in a few months to scout some painting spots. Here's a link to some virtual tours of the campus environs. Rest assured, there will be plenty to paint! There's plenty of useful information on both websites, but feel free to email me if you have any other questions. My contact info is listed on my profile page.